Sometimes it’s the little things, ya know?? This recipe was an accidental brainchild, a dish born out of necessity. My dad was in town a couple weeks ago and I invited a friend over to spend time with us. He chose brunch, so I decided to make my whole grain Belgian waffles. Things were pretty rushed that morning since my dad was helping me install gas logs in my fireplace and we had run into some snags (we took 5—count ’em, 5—trips to Home Depot that weekend). I knew I needed to provide some eggs with my waffles, but couldn’t bring myself to do boring old scrambled. My next thought was omelettes, which is my go-to egg dish when serving less than 5 people (any more, and you need to upgrade to a casserole or something). I rooted around in my fridge and came up with what I thought was the perfect combination. 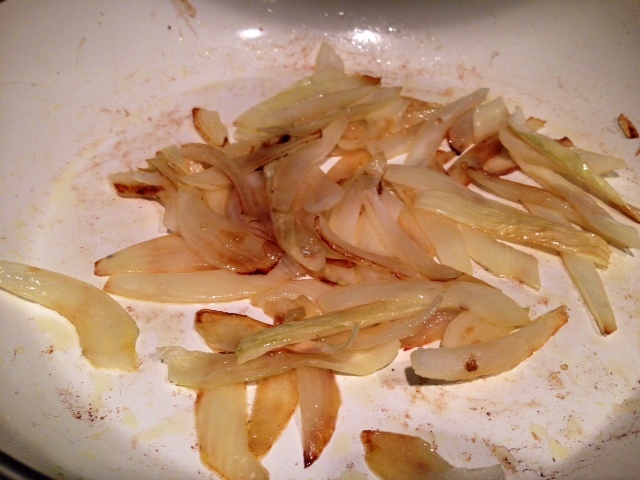 I had a half of a yellow onion left from dinner the night before, so I sliced it up in strips and caramelized it. 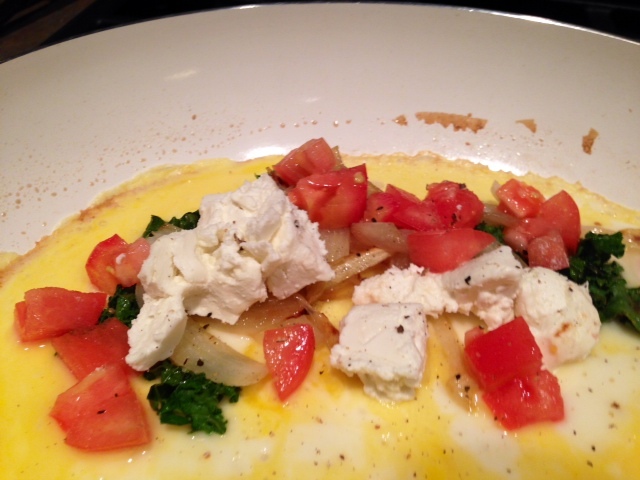 Then I sauteed up a little kale, chopped up some tomatoes and goat cheese, and threw it all in an omelette. I figured it’d be pretty good and would more than satisfy these two dudes’ palates. But wow, was I surprised at how good it was! This one is definitely a keeper. Add a little shaved parmesan as garnish, and we’re in business. 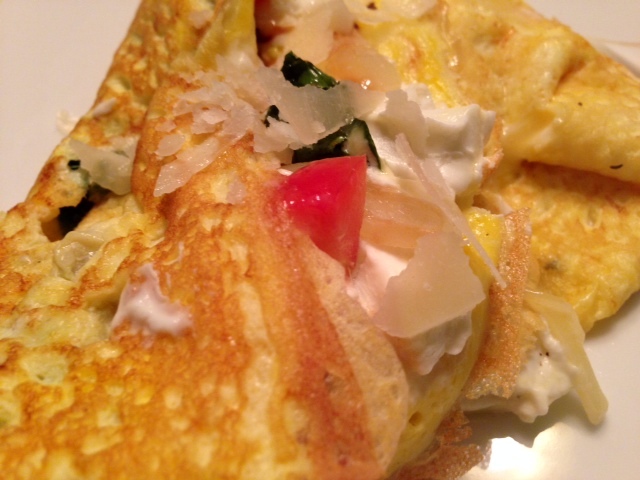 Omelettes are a fairly regular part of my dietary rotation, my go-to egg dish with company. 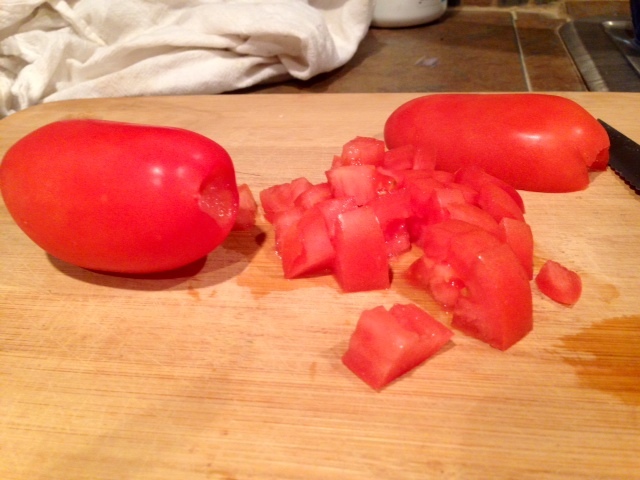 I’ll make them with whatever I have on-hand—garlic, peppers, tomatoes, various cheese, herbs, whatever. But these were kind of a revelation. The kale gave it some chew, the tomatoes and caramelized onions provided a sweetness, and the goat cheese melted into this creamy pool of awesomeness. It was the perfect combination of flavors. 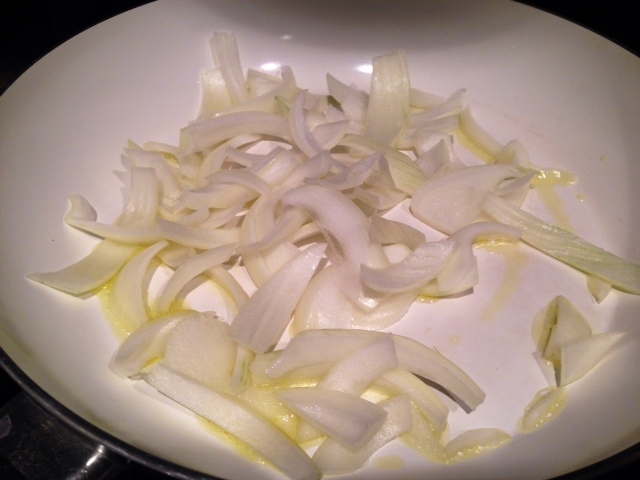 You’ll want to start the onions earlier than everything else, because you can’t really rush caramelizing. But you can set them to cook while you make all the rest of the meal. Thinly slice up the onion and throw in a non-stick skillet with a tablespoon or two of olive oil and a heavy pinch of salt. Cook on medium-low (maybe a 4, 5 at the most) until they turn soft and brown. The low heat is critical in the caramelizing process. I had to rush mine a little, so they weren’t fully caramelized, but you definitely don’t want to just turn up the heat to make them cook faster. Then you’ll just get sauteed onions, which is NOT the same thing. 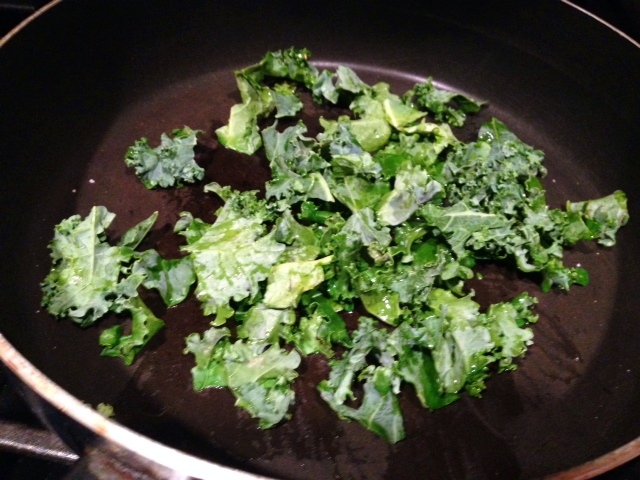 Saute up some kale for 4-5 minutes in a pan with a little olive oil. And, if you’re feeling fancy, put them in those little chef prep bowls. Makes me feel legit. 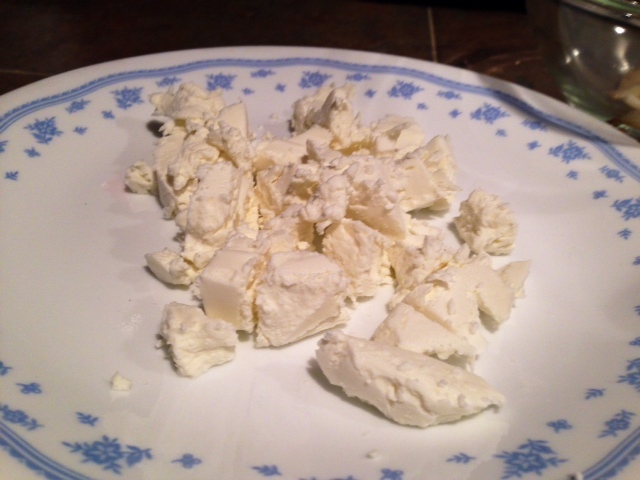 Beat 2 or 3 eggs in a bowl, and add a dollop of milk or cream. I personally always just make the exact right amount of eggs each time, because if I try to beat several eggs together and then just pour a certain amount out, I fail. That’s how my mom does it, though. These were 3-egg omelettes, though mine was a 2-egg. It will partly depend on how big your pan is. Heat a pan up to medium-high, spray with a little cooking spray, and pour the egg mixture in. Swirl it around until it’s evenly coating the pan, then season with salt and pepper while the egg sets. You can see how the picture looks, this is about as set as you want it before folding and flipping. Once the egg starts to set, quickly spread your ingredients on half of the omelette. If you’re using some shredded cheese as well (which I recommend), that can go on the other half too. Using your rubber spatula (which I recommend) or whatever implement you prefer, gently flip the bare half onto the ingredients and lightly tamp down. Let cook for another few seconds, and then slide your spatula underneath and flip over onto the other side. Let cook for another minute or two. You don’t want it overcooked, but want to make sure most of the raw egg is cooked (or the inside is gushy, and that’s not great). 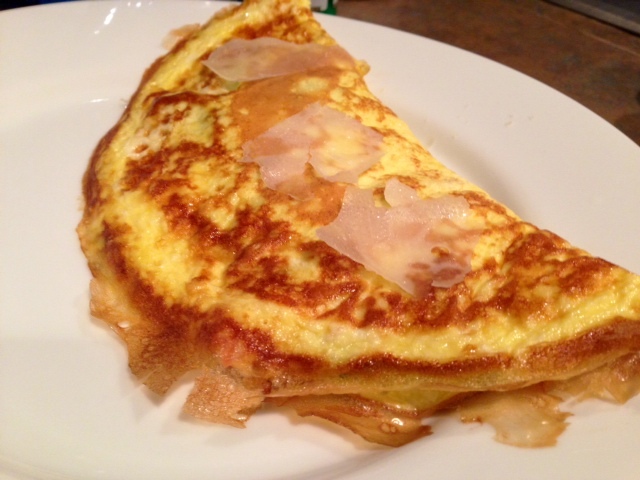 As soon as I flipped it, I also threw a few parmesan shavings on top so they melted. Mmmm! Serve immediately, then move on to the next one. 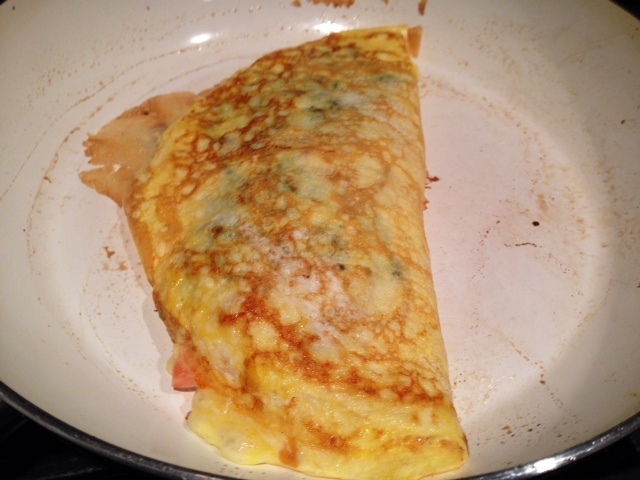 It’s better with omelettes to let people eat them as they come, or work multiple pans. It’s sad when everything gets cold. 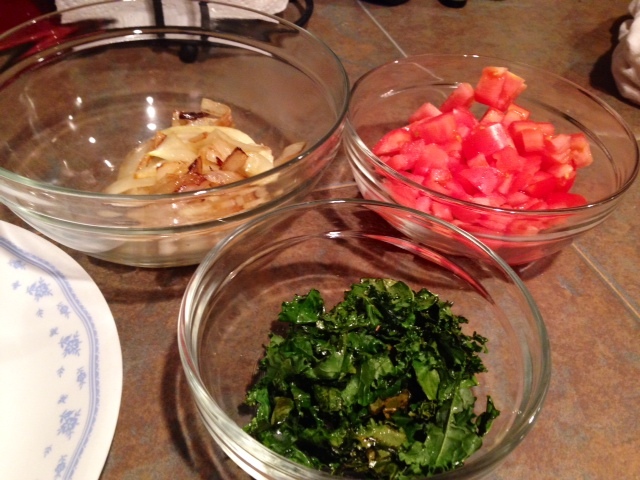 Prep all ingredients ahead of time, because once you start cooking the omelettes it goes very quickly. Cut up the onion into thin slices and place in a non-stick pan on medium-low with a couple tablespoons of olive oil and a pinch of salt. Let cook, stirring occasionally, until caramlized—time will depend on the onion and your stove, but will be at least 10 minutes & probably closer to 20. You can do this while you’re preparing other breakfast-y things, setting the table, etc. 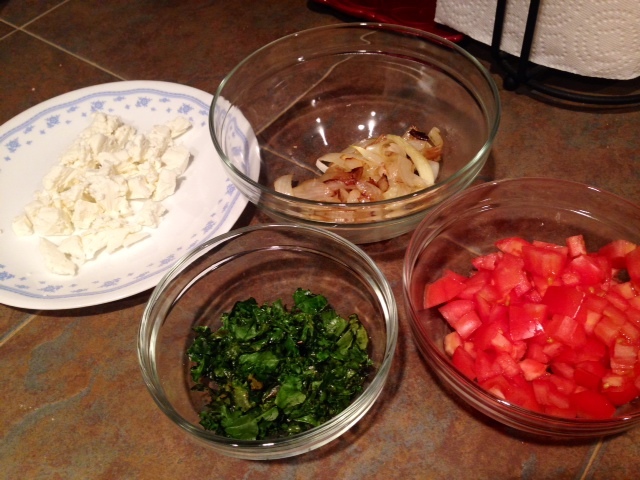 Finely dice the tomatoes, saute up the kale in a pan on medium-high for a few minutes, and cut or break the goat cheese into smaller chunks. Whisk 2-3 eggs and a dollop of milk in a bowl. Heat a pan up to medium-high, spray with a little cooking spray, and pour the egg mixture in. Swirl it around until it’s evenly coating the pan, then season with salt and pepper while the egg sets for a minute. 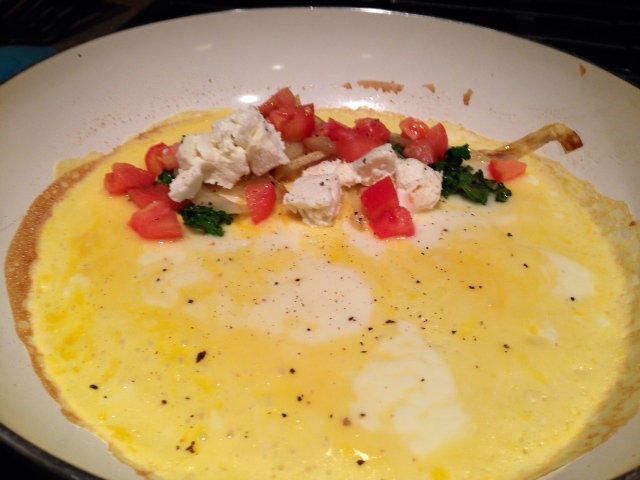 Once the egg starts to set, quickly spread your ingredients on half of the omelette. Sprinkle shredded cheese over the whole omelette, then fold over the bare half and lightly pat down (try to seal the edges if you can). Let it cook for another few seconds (maybe 30 seconds), and then slide your spatula underneath and flip over onto the other side. Let it cook for another minute or two. You don’t want it overcooked, but want to make sure most of the raw egg is cooked (or the inside is gushy, and that’s not great). As soon as you flip it, garnish with a few parmesan shavings (if you roll that way).